Patients with the best oral health understand that flossing and brushing is an unbeatable combination when it comes to your teeth. If you have trouble remembering to floss each day, here are a few reasons to get with the program! 1. Flossing can save you money. How? It helps to preserve your oral health, preventing the need for a costly dental visit due to negligence. 2. Brushing and flossing are more effective together than alone. Without flossing, you’re missing out on cleaning about 30% of your teeth and gums. 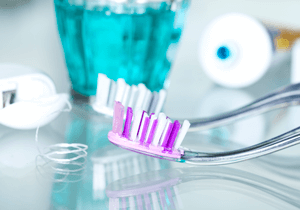 Without brushing, you’re missing out on fresh breath and cleaning the surface of your teeth. 3. Flossing influences your overall health. 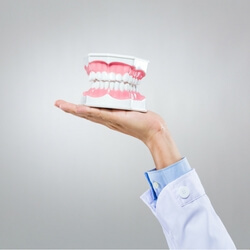 Did you know that gum disease could lead to problems elsewhere in the body? Consider how flossing takes just a few seconds to save years of your health. Maybe you’ve noticed that your co-workers tend to back up when you’re speaking to them directly. Or, perhaps you can’t shake the bewildering smell that seems to follow you wherever you go. Newsflash: It might be your breath. While it’s difficult to smell our own breath and know when there’s an issue, here are a few steps you can take to banish it from your everyday life. Drink more water. A dry mouth after consuming food that lingers on your breath can be a recipe for disaster. Staying hydrated helps to minimise bad breath odours. Ask someone you trust. If you’re dealing with frequent bad breath yet you brush and floss as directed each day, let us know at your next visit. You visit our practice every six months for your checkup and clean…but this time, we’ve recommended you consider a deep cleaning. If you’ve never had one before, you might be confused as to what it entails. Here’s how one can benefit your oral health. A regular dental cleaning focuses on cleaning your mouth above the gum line and polishing your teeth. When patients have healthy teeth and gums, this is standard routine care. 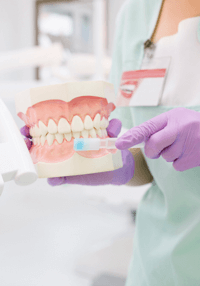 For patients who may be dealing with early signs of gum disease or periodontitis, a deep clean (also known as “root planing”) is typically recommended. This appointment generally takes a bit longer to complete as it involves cleaning deep under your gums and in the pockets of your teeth to remove bacteria. Are you due for a deep clean? Ask us at your next appointment.